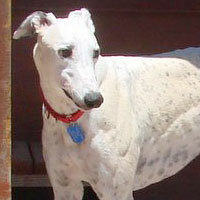 My name is Winston and my coloring is rather distinctive: white with black spots. Some uninitiated person could mistake me for a Dalmatian but not a true greyhound lover. I like to lean my head on your shoulder when you’re grooming or petting me. I really enjoy that one-on-one connection. I can ROO you awake in the mornings when I’m playing with my squeaky toys at 5:30 a.m. You’ll never miss that important morning meeting with me around. I’m sorta medium size and don’t take up much space when I’m curled up on a doggie bed or on the couch next to you. I’ve been trained to trot alongside you on our walks and not drag you through the wash on your belly if I spot something worth chasing. Course, there are always exceptions in life, don’t ya think – HA!